This Campaign Page is for the Shattered Star campaign, set in Magnimar. More information will be posted here as it becomes available. Leave comments here to reach your fellow players, and I’ll be checking this as well! You can also contact me (your GM) directly. 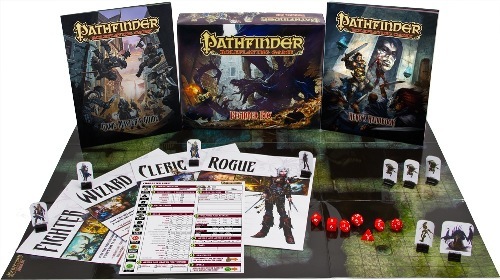 When agents of the newest Pathfinder Society lodge in Magnimar learn of a fragmented artifact from the ancient Thassilonian civilization scattered throughout Varisia, it falls to a new band of heroes to step in and gather up the seven fragments. For if the greatest prize of Thassilon’s first ruler cannot save Varisia… what can? During your quest, you will hunt for a sundered artifact, its pieces scattered throughout the land in some of its most dangerous and notorious dungeons. Will you be able to reunite the Shattered Star? Is it true that Leo number 3 is Leo's brother? Weird! why are our pictures shapes? I just thought they’d be good for this site. But hey can’t you upload your own picture somehow? You might have to register an account.